For a Yorkshire girl like myself, an overnight trip to Lancashire may not be a list-topper, but let me assure you the Wars of the Roses are well and true over, and a visit over the border could well hold a few rather pleasant surprises. I travelled for a one-night stay at The Lawrence Hotel, situated in the small town of Padiham, about three miles from Burnley and just south of the infamous Pendle Hill (you don’t need your broomstick these days…). As this was the weekend after Mother’s Day, it seemed only right and proper for me to invite my Mum along for a girly night away from it all. In just a couple of hours, we have made our way over the Pennines and arrived in the pretty town of Padiham. The Lawrence is centrally located and was originally built in 1821 as a grand house, doctor’s surgery and stables. An extension was added in the 1980s and the hotel has been under new ownership for the last couple of years. During this time, the property has been through a full renovation project, so although the building retains its age from the outside, inside is a different story. The director of the hotel, Michael Huckerby, greets us upon arrival, and alongside his faithful companion Hetti (the hotel’s resident Sprocker) shows us around. 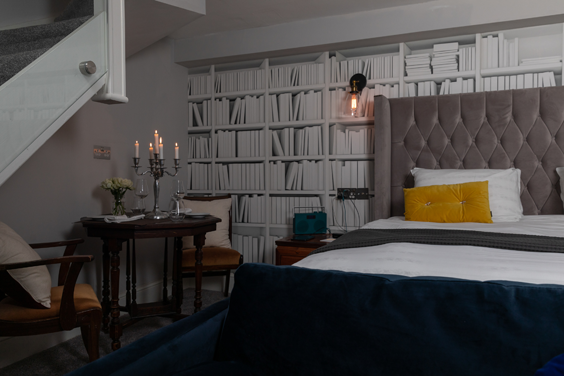 The Lawrence combines the very best of both modern and original – each room contains period furniture, the walls are adorned with antique mirrors, and there is an honesty bar – not something you’d find in a modern hotel chain. However, all this juxtaposes beautifully with just about every mod con you could think of. Our room, the Ava Suite, spans two floors – the upper floor housing a “floating bathroom” with a huge roll top bath and large rainfall shower; and the lower floor home to a super king size bed (with Simba mattress), a sumptuous sofa, large screen smart TV and seating area. It is down here you will find a digital radio, speaker system, a Samsung tablet for all your internet needs and a Nespresso coffee machine. This is in addition to the usual tea and coffee making facilities, luxurious Temple Spa toiletries, complimentary mineral water, sweetie jar and quite frankly the most delicious chocolate brownies I have ever tasted – and I’ve had a few! We are off to a flying start and, after a lush soak in the bath, dinner in the restaurant awaits. 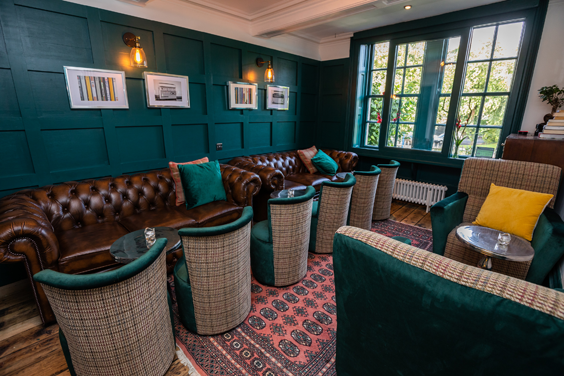 After a relaxing drink in the bar, our friendly and knowledgeable waiter shows us through to the small yet perfectly formed restaurant, which is also open to non residents, and opens out on to a small courtyard area – perfect for an al fresco drink during the summer months. Alongside a chilled bottle of rosé, we embark on our starters (ranging from £4.40 to £6.75). My king prawn, chorizo, garlic and chilli butter dish is so moreish I could make a meal of that alone. 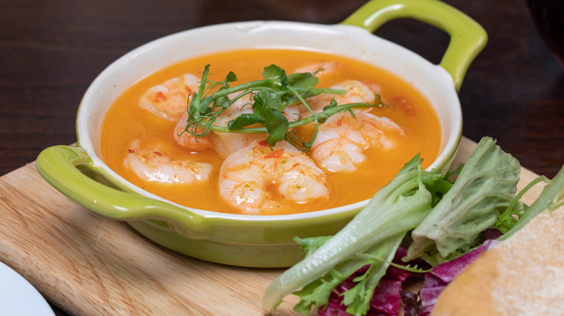 Just the right side of spicy with succulent prawns – it doesn’t hang around for long! My Mum opts for the mushrooms in a creamy tarragon sauce served on toasted ciabatta and deems it delicious – her clean plate confirms as much. The main courses all sound tempting, including pan fried sea bass with chorizo (£15.95); chicken ranchero (£12.50); and Ribble Valley Farm sausage and mash (£10.50); but it is the 8oz sirloin steak (£19.95) that we both decide to go for. Accompanied by all the traditional trimmings – mushrooms, tomato, onion rings and triple-cooked chips – this is a hearty plate of food cooked to perfection. I choose a pepper sauce while my Mum is advised to go for the port and stilton – an excellent tip from our waiter. 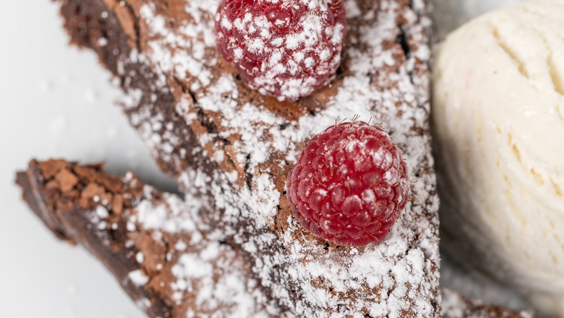 Unfortunately the dessert menu is a step too far for us but with options including lemon posset, chocolate brownies and Eton mess (all £6) there is something for everyone should you have the room! We do however finish the meal off with Baileys coffees and enjoy the ambience and buzz of the busy restaurant before heading up to our room with full stomachs and big smiles. After a fantastic sleep, courtesy of the Simba mattress (and probably the previous night’s food and drink) we head back down for breakfast. We had pre-ordered this the day before in order to take full advantage of the hotel’s fresh-food policy. Ingredients are sourced from a local farm shop and ordered fresh each day. Our full English breakfasts are delicious and alongside plenty of cereals, yogurts, fruit etc, really helps to set us up for the day. Special mention must go to the coffee which really hits the spot for a couple of slightly sore heads! Having taken the direct route the day before, we decide to take a scenic drive back, so having bid farewell to Michael and Hetti, we set off towards Skipton via the infamous Pendle Hill. After a drive through Harrogate we stop off in stunning Knaresborough – home to Mother Shipton’s Cave, the ruins of Knaresborough Castle and the railway viaduct over the River Nidd. As well as these stop-off points, The Lawrence is perfectly situated for visiting the Forest of Bowland, the Yorkshire Dales, or even Manchester for a spot of shopping. So, against all the odds, this Yorkshire girl actually enjoyed her time across the border, and if it means another stay at The Lawrence, she might even make a return visit. Rooms at The Lawrence are available from £79 per night. The newly opened restaurant on site The Courtyard Room is open to residents and public.